Christmas! It’s now in less than a month already, and Advent starts on Sunday! Just craziness! 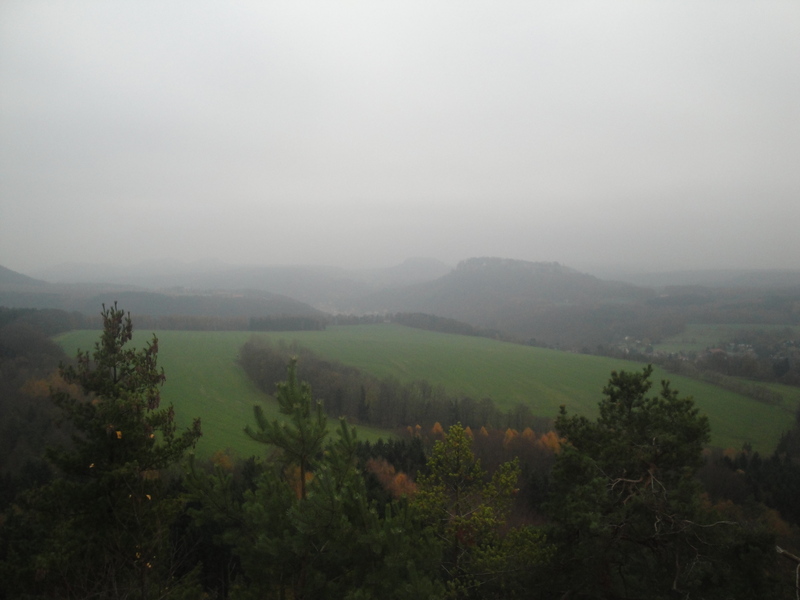 One of the things that motivated me to come back to Germany was the thought of experiencing Christmastime here. There are a lot of amazing German Christmas traditions, many of which America has adopted (the Christmas tree, for instance), and this season just has a certain charm to it here that I am excited to experience. The season is slowly beginning!! My roommate Agnes and I baked some Christmas cookies this weekend… well, Agnes really did most of it but I helped with the cookie cutters and chopping up ingredients a little bit. 🙂 So now we have a nice stash of Christmas cookies to hopefully last us the next month! We’re celebrating Thanksgiving here, though a few days late. (I have classes ALL DAY on Thursday… boooo.) Agnes and I are hosting a dinner at our apartment on Sunday, and Felicitas and I are going to do our best to create some American dishes with German ingredients. We’re hoping to find some cranberries somewhere, and I’m going to cook some turkey (not A turkey. Some turkey). Our guests are contributing dishes, as well, so it will be a real international potluck! I’m excited. IT SNOWED TODAY!!!! It was so wonderful to wake up to a nice soft flurry outside my window! It didn’t keep up all day, but it was still snowing a bit by the time I headed to campus in the early afternoon, so that was nice. I know it will snow far too much for my liking before long, so I’m glad that at least my first day of snow was a lovely, sunny day with blue skies. And check it out... 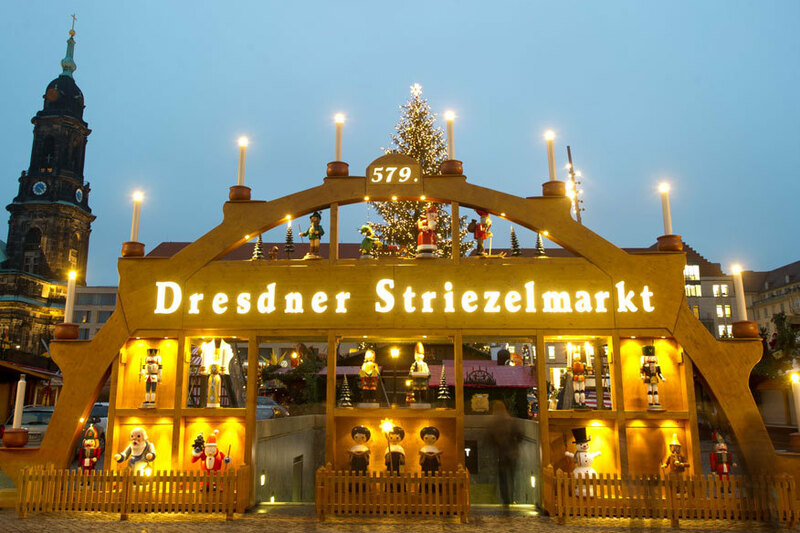 This article lists Dresden’s Christmas market as one of the top 11 in Germany!! It opens tomorrow, but I did happen to walk through on Friday… some of the booths were just getting set up, and it was absolutely magical. I can’t wait to visit soon!!! Glühwein, Stollen, adorable Christmas figurines… I cannot wait. 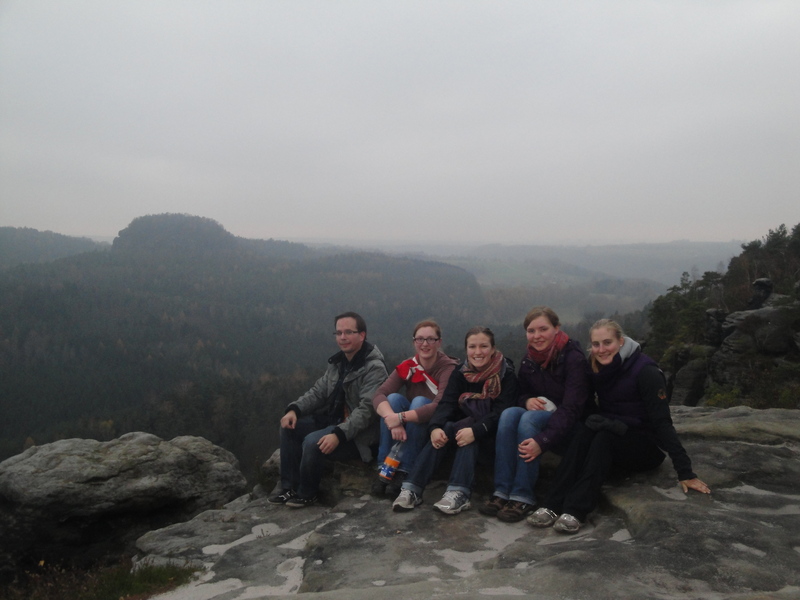 I’ve started doing some things with the KSG (Katholische Studentengemeinde) here in Dresden. 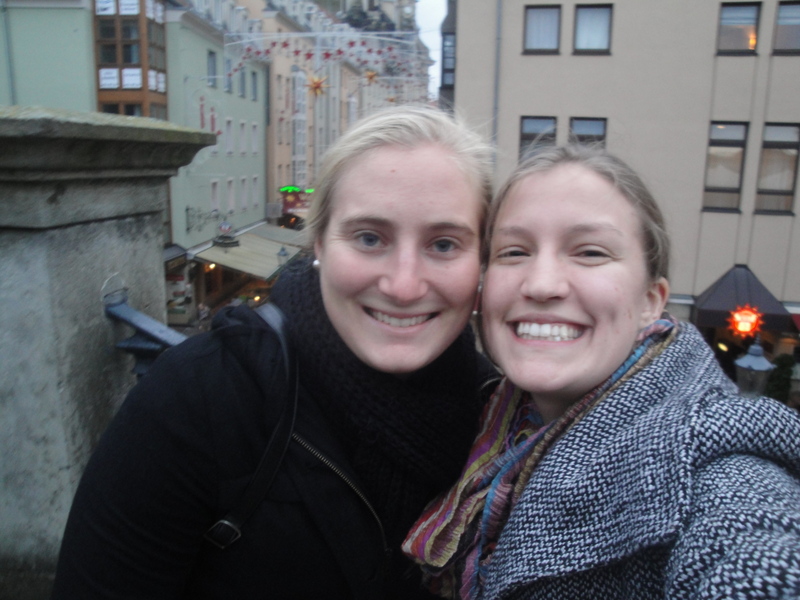 I found in Freiburg that joining the Catholic student group was a wonderful way to meet friends and have some sort of social life while studying abroad, so I made sure to find a similar group here in Dresden once I arrived. Of course, no Catholic community is ever PERFECT or everything you’d want it to be, but everyone I’ve met so far has been lovely. 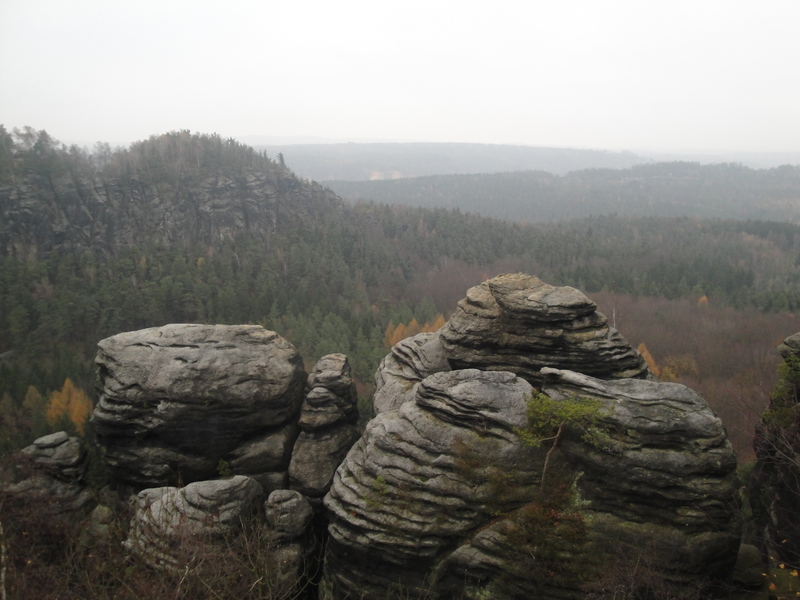 This past weekend, I went out to the Saxon Switzerland for a weekend with some KSG folks in Struppen. The KSG has a house out there, which was donated by the Diocese a number of years ago to be used by the students from Dresden, and a group goes basically every weekend. 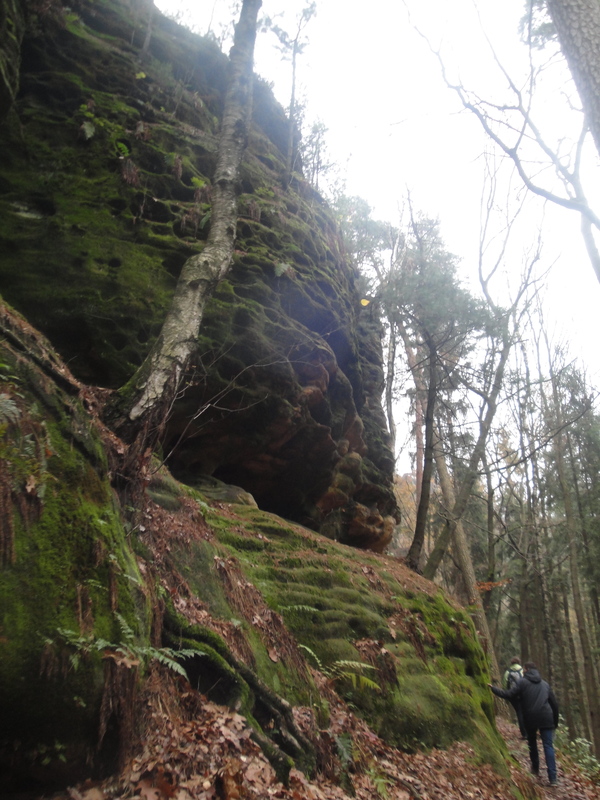 I enjoyed a few days of fellowship, food, nature, and manual labor… and it was wonderful! Everyone was so welcoming and warm, especially because it was a designated weekend for new people. It was about 60% students who are new to Dresden/the KSG, and 40% people who have been around for awhile, so it was a nice mix. Something interesting that’s come up as I’ve met more people in Dresden and the KSG is the issue of language. I don’t necessarily have many problems anymore socializing in German… I’m generally pretty comfortable with it. But what’s really weird is switching between English and German. 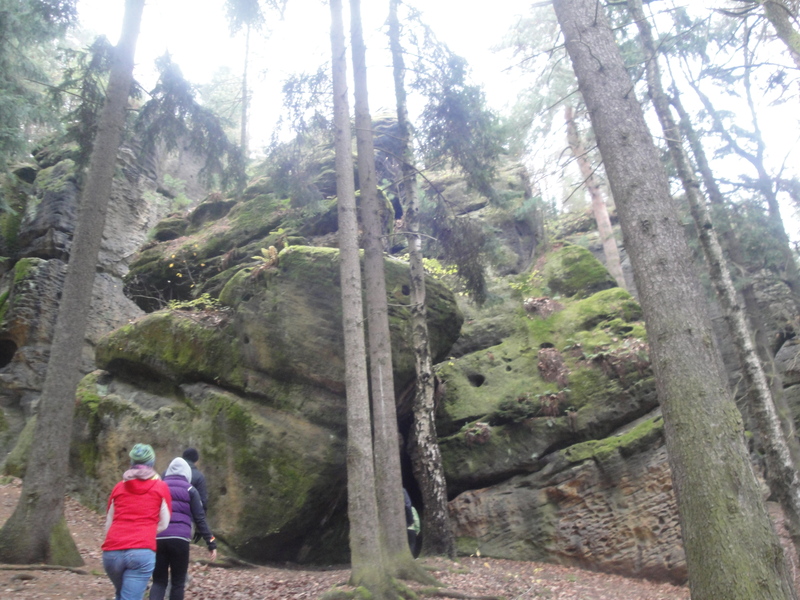 For instance, at the Neuenwochenende in Struppen, although most people were German, there were also 5 international students including myself: two from the US (myself and Flitzi), one from Hungary, one from France, and one from Britain. Of course, when I was speaking to one of the German students, we would speak German; and even with Geoffroy from France or Domi from Hungary, since we don’t share a native language, speaking (flawed) German was the natural choice. But if I would be talking to Flitzi, especially since we often see each other one-on-one and obviously speak English, or Flitzi and our new British friend Nathaniel, of course our first instinct would be to speak English… but what if there were some other German friends around? Should we try to speak German? But then we’d run into things in the course of our conversation that would just be EASIER to say in English… or someone would point out how ridiculous it would be for two Americans and a Brit to stand around speaking German, or a German would want to practice their English… the list goes on. It was just a very linguistically interesting weekend. Flitzi and I would have an English conversation, only to change to German when we joined someone else’s conversation, and then start speaking German just between us. And then, of course, language quickly becomes the topic of conversation! Viki, one of the German girls I’ve befriended, worked as an au pair in Maryland for a year, and she prefers American to British English (she actually goes as far as to say she thinks American accents are beautiful! I’ve never heard that one before!). So naturally, while hiking 14 kilometers, we thought of as many differences between British and American English as we could and made fun of Nathaniel about them for a while. To his credit, he did maintain that saying “lift” instead of “elevator” is just economical, as is “flat” for “apartment.” I guess that’s accurate. I just found this picture (very small and bad quality because I couldn’t find it anywhere else on the internet!) while clicking through some websites to find interview contacts for my research. This is the street leading up to the castle and cathedral in Dresden… taken in 1934, a year after the Nazi Party gained power. I walk down this street at least every week. Kind of striking, isn’t it? It’s just crazy to me that so many of the places I go every day have hosted some of the most decisive historical people and events of the last century. After a long afternoon of research and all that that entails (actually, worse than research: defining the scope of my project. 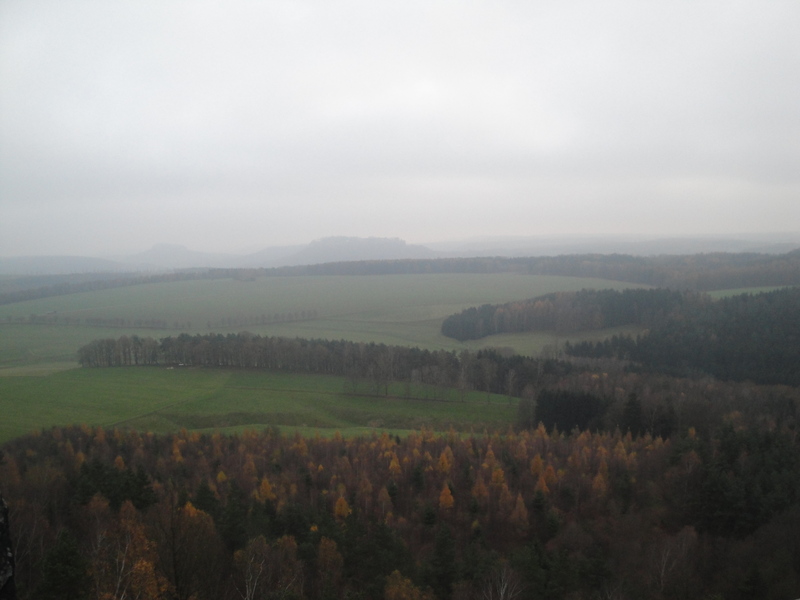 Probably the most tiring mental activity out there), how about I give you guys a list of cultural observations about Germany and/or Germans? Shopping carts: Until today, I was under the impression that you had to pay a euro to use a cart at the grocery store. However, upon closer inspection, I realized that it’s really just a deposit system! If you want to use a cart, you insert a euro coin into the chain apparatus that locks the carts to each other, which releases the first cart. Then the euro hangs out in the apparatus on your cart until you return it, at which point you get your coin back. It’s the kind of thing that, when an American first hears about it, sounds overly strict and kind of nutty, but then slowly begins to make sense. The lockers at the library operate on a similar deposit system, but I feel like that’s something that would maybe happen in the US, so it’s not as shocking. Pfand system: Speaking of deposits, the Pfand system is the German incentive to recycle. When you buy a drink that comes in a plastic bottle, most times you pay 25 or 50 cents extra for the “Pfand.” Then, when you’re done with the bottle, you can return it to one of the many special machines, normally in grocery or convenience stores, that then reimburse you the Pfand money. I know that Pfand money isn’t REALLY extra money that you get for recycling, but it is kind of cool to start out with a big bag of bottles and end up with a few extra euro. Lack of WiFi: I really can’t complain about this TOO much because at least there is WiFi (or as the Germans would call it, WLAN) on campus and in my apartment, the two places where I am 89% of the time. But being in England for a few days and at least being able to duck into Starbucks for some free WiFi made me a wee bit jealous. Apparently some arrangement with music companies in Germany specifically has restricted public internet access more than in other places…? Different paperwork/accounts/passwords, etc. for EVERYTHING! : For instance, at my American university, we had one ID card that served as an ID card, payment method for dining halls, library card, and bus pass. We had one username/password set for everything having to do with the university. Here, I have an ID card/transport ticket, separate card for the Mensa/dining hall, and a separate library card, and I somehow need to keep track of separate usernames and passwords for my student e-mail, online course portals, and library account. Something tells me there is a more efficient way to do this, Germany! This seems to extend beyond student life, from what I’ve observed. For instance, in the US if you’re an organ donor, it just says so on your driver’s license, but here if you’re an organ donor, you need to carry a separate card. This seems to go against the streamlined approach that Germans love, vis the above Pfand/grocery cart systems… if you want to make it easy for organ donors to be identified, you better make sure they always have that ID card with them! So you’d think the best way to do that would be to combine the organ donor ID with an ID card that they would have to take everywhere, anyway…. I’m rambling. I’m sure there are way more examples of little operational differences between Germany and the US, but these are the ones I’ve run into lately and/or often! I wish you a very efficient day! Saturday: Since I missed the East End Tour on Friday, I decided to go on Saturday instead! The tour started at Liverpool Street Station, so I headed there first thing. Luckily, there is a Starbucks in the station so I was able to get a few messages out to Joey suggesting a few places to meet for tea later in the day. The tour was smaller than the first I’d taken… it was me, a family of 4, two college-age students from Australia, and an English dad and his son, all led by our tour guide, who had a fantastic mustache. 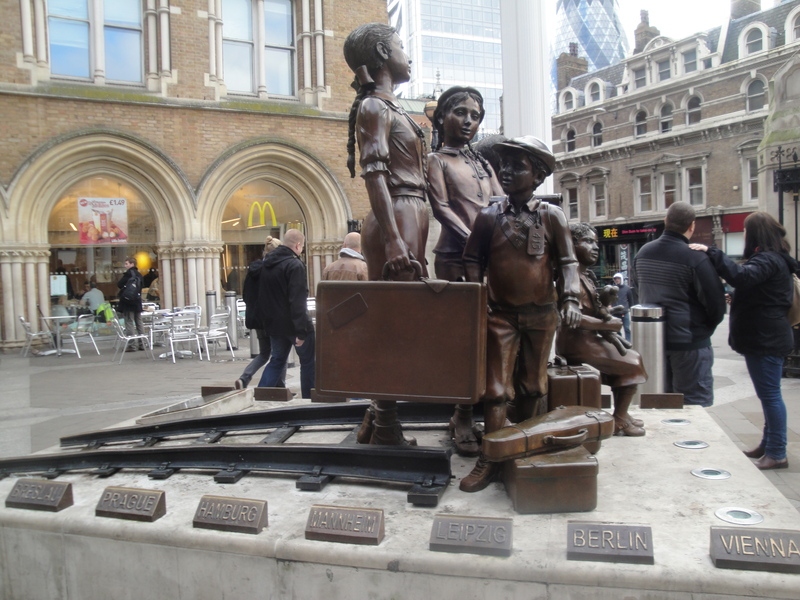 Starting the tour with some German flair… this monument thanks the English, on behalf of the international Jewish community, for sheltering thousands of Jewish children from central and eastern Europe who came to London via Liverpool Street Station during WWII. Now, I wasn’t incredibly crazy about this tour, but we did get to learn some interesting history: apparently the Liverpool Street Station was originally Bethlehem Mental Hospital (colloquially called “Bedlam,” which is where we got the phrase meaning “madness”) back in the days when mental hospitals weren’t incredibly common. Then, apparently, the wonders of capitalism opened up the hospital for tourism! What an awful thought. We walked into the actual city of London, which is really a tiny, tiny area governed entirely by banks. The bankers do apparently have a disturbing amount of power in Parliament. 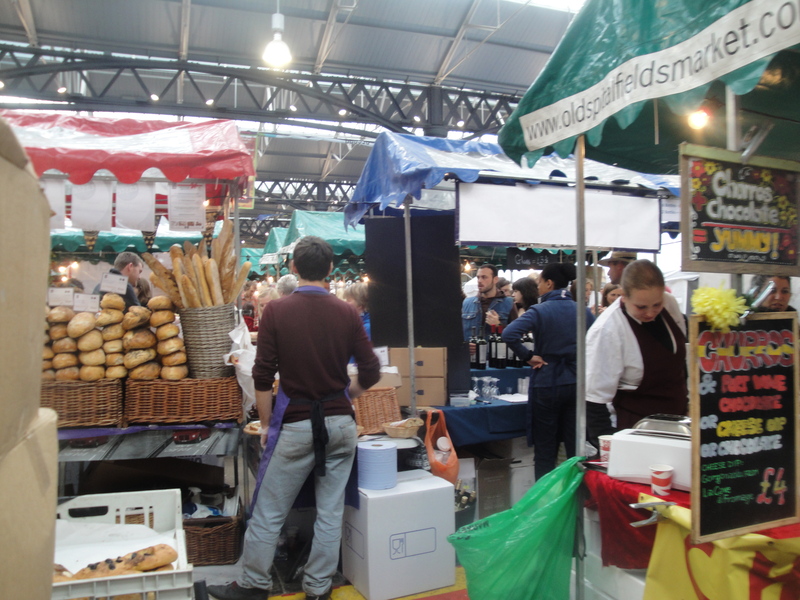 We saw Old Spitalfield Market, which was cool because I actually learned about Victorian London food systems in a class I took last year, as well as some really, really old ruins of the burial grounds that used to surround the hospital that Spitalfield was named for. And we learned as much as we could about Jack the Ripper, which really isn’t much because no one really knows anything about him. 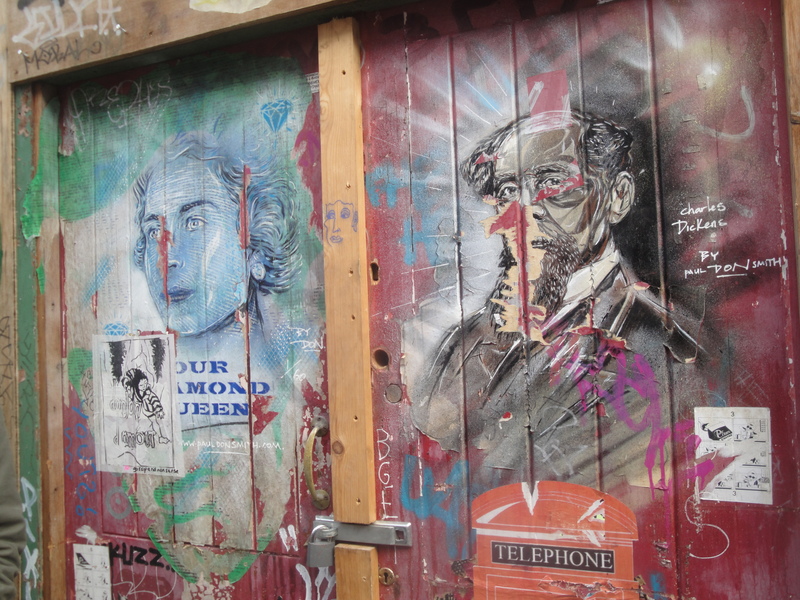 Then we saw some street art, which I guess was cool but isn’t really my jam. I’d say my main takeaway from this tour was the general feel I got for the East End, past and present: a real melting pot of immigrants, lower-class people figuring out how to get by in such a huge, international, at times incredibly unsafe city. The danger comes from many places: poverty, violence, fire, raw sewage flowing down your street… I got to see parts of the city I wouldn’t have otherwise seen, or known what to make of, or wouldn’t have probably felt comfortable walking through all alone. I then made my way back to Starbucks to see what kind of plan Joey had formed in my absence. Not a great one, it turned out, since we had decided on an even worse meeting place than the previous day’s… the Tube stop in the neighborhood where we’d be having tea. It turns out that a Tube stop is actually the worst place to meet someone if you won’t be able to call each other and you aren’t exactly sure what time you will arrive. But we finally found each other and walked to the cutest little tea place. As we enjoyed our tea, scones, and cake, Joey and I conversed about our common UT experience, our study abroad experience, and other random life things. It was nice and relaxed. However, during this time I was also fiddling with my shoe and actually loosened the heel such that it was definitely about to come off. I figured I could get through the next day and then get them repaired in Dresden. After tea, we walked around in the incredibly posh surrounding neighborhoods of Chelsea, Kensington, and Notting Hill. If you wanted to go into a really cute book shop or antique shop or something, I guess this is where you’d do it. I think this is the area Princess Diana is from, and of course it’s where the cinema classic Notting Hill took place so you know it’s legit. At this point, I think we headed to the British Museum with the intent of actually seeing a few exhibits, but by the time we got there, it was just closing, so we changed our plan a little bit. 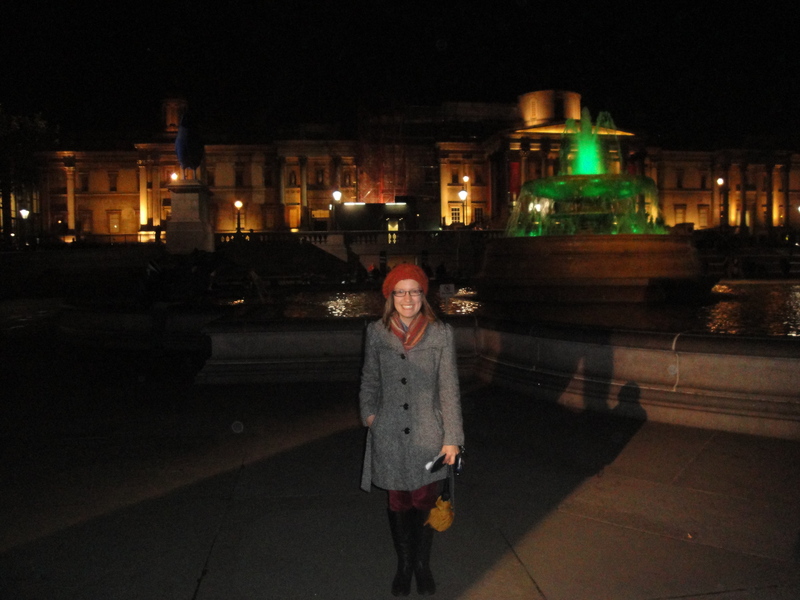 We walked over to the nearby Piccadilly Circus to see what all the fuss was about. From what I could tell, it’s like London’s version of Time’s Square… some big screens around, lots of big commercial things like Ripley’s Believe It Or Not and some theaters… we decided it would be best to find a pub somewhere and sit down with a beer. Figuring that most places in this area would be super expensive, we were very choosy and ended up finding a Pret first and getting a sandwich. Pret is weird in that they charge you more for your food if you’re planning to eat in the restaurant, so we took our food outside. We ended up getting really cold and just going into the nearest bar, which was actually a great decision, because the beer was delicious and very affordable! So we enjoyed our beer and some more great conversation, casually observing everyone else’s ridiculous Halloween costumes. Then we headed back to our respective homes after deciding on a sane and reasonable meeting place for the next day: the church next to my hostel. Sunday: As it turned out, my hostel was actually right next door to an apparently well known Anglican Use Church. I had never been to an Anglican Use Mass before, but a friend of mine wrote his Plan II thesis about Anglican Use in Texas, so I knew a little about it, and because it was so close by (to me, not to Joey at all), it was the natural option for Sunday Mass. It was really beautiful (despite the interesting use of space in the church, haha). They used wonderful music and the visiting priest gave a great homily. Afterwards, we stayed for tea and biscuits with some of the parishioners. One very friendly guy told us all about Our Lady of Walsingham, an apparition of Mary very important to the Anglo-Catholic Church, and introduced us to the organist, who promptly made it weird by asking if we were visiting the church because we wanted to get married there. After uncomfortably laughing our way through the explanation that we are just friends from college, we decided to leave and get some lunch, which was not as easy as I had expected because all the restaurants on the main street in Battersea were apparently closed for Sunday lunch. So we ended up going into town, where I made things difficult by being incredibly indecisive… we ended up getting deciding on an Asian fast food place, of sorts. Then, we finally made it to the British Museum, where we perused their Europe exhibit, which was simultaneously interesting and disappointing. For instance, they had a whole room devoted to clocks and watches through the years, and then a room half the size devoted to the entire 20th century, which mainly included Russian plates and cutlery that looked like it was from Ikea (and which did not reference either of the World Wars). There was one big room displaying items from Europe between 1400-1800 and William Shakespeare didn’t get a single mention. It was odd. 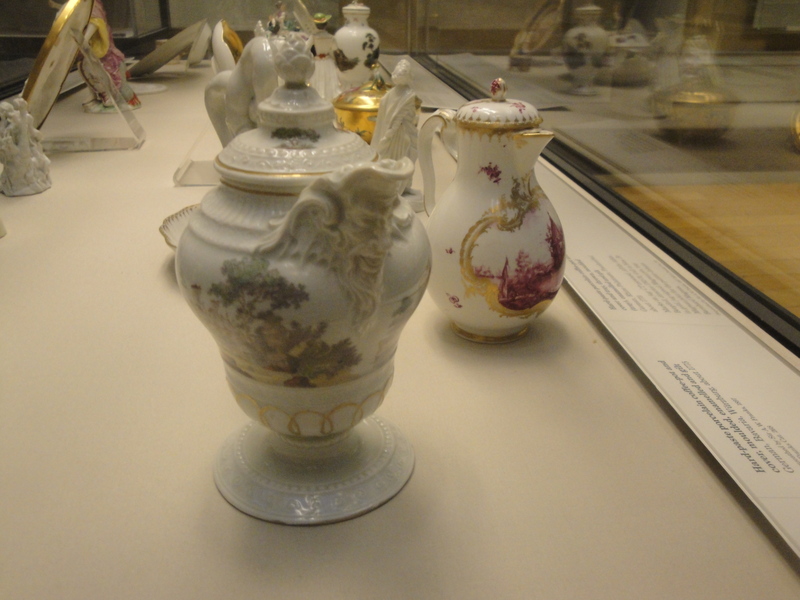 Meanwhile, I admired some teapots. 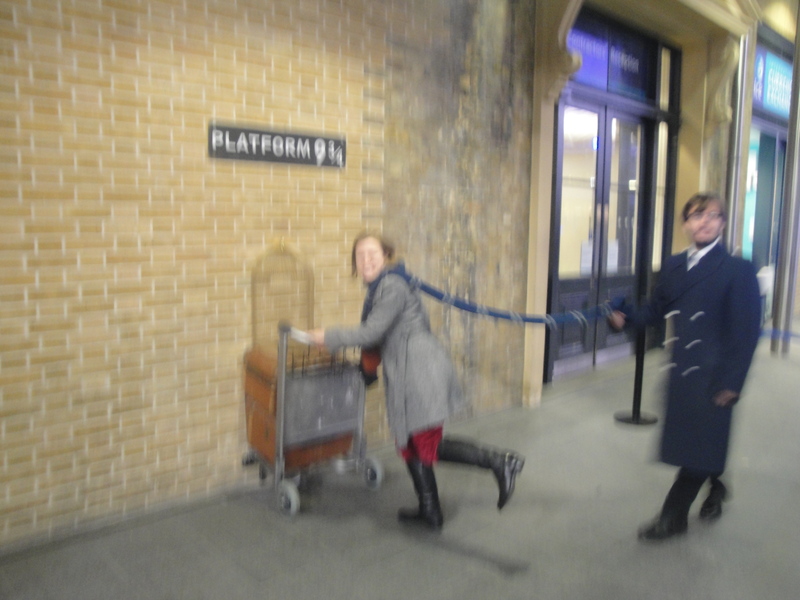 We then bopped around north central London for a bit, walking through a couple of parks on our way to King’s Cross Station, which it turns out isn’t really near anything, but any self-respecting Harry Potter fan needs to go to take the touristy picture near Platform 9 3/4, so that’s what we did! 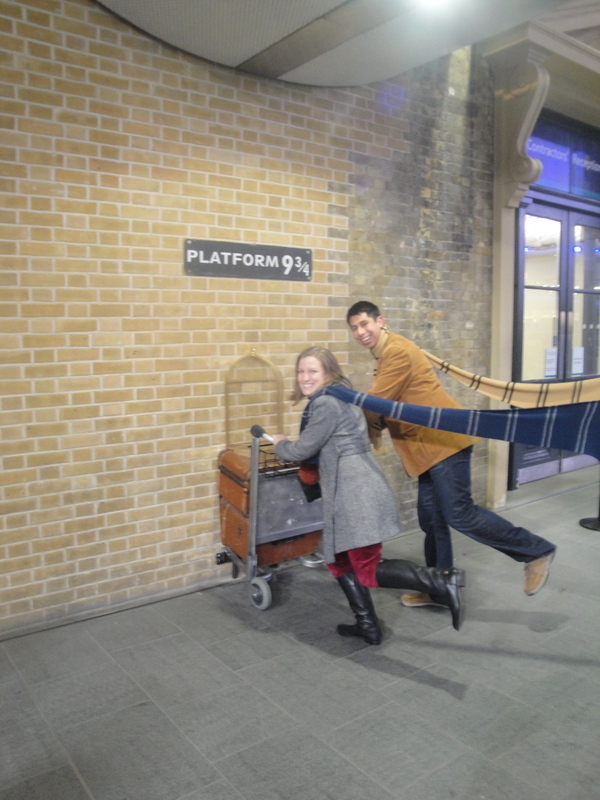 We waited in a line filled with children and their parents, proudly donned our chosen House’s scarves (Ravenclaw all the way! ), and posed for professional photographs we were too cheap to pay for while also forgetting to turn on the flash of our own cameras, rendering our personal photos entirely too blurry. But, alas, it happened and we were very excited. Then we walked around the surrounding neighborhood for about 25 minutes (it seemed like an eternity because my feet were absolutely killing me!) looking for somewhere that would sell us dessert. Joey had a craving for a chocolate souffle, of all things, and while that request may have been entirely unrealistic, we didn’t find a single (open) place that even served food. So we headed back to the station and ate there. I had a strawberry tart and some tea and it was glorious. As it started to get late, I realized that I should probably figure out how I would go about getting to the airport in the morning. Luckily, as we were at King’s Cross, I could buy a train ticket to the airport right there, so I did, and we slowly made our way back home. It was really great to spend some time with a friend from home, and Joey was a great host in his new city. It’s a lot of fun to travel solo and explore a new city on your own, but it is a different kind of fun to share it with a friend.